Concern about the environment is widespread throughout much of the world. Majorities in every country included in the survey continue to rate global warming as a serious problem. Moreover, many international publics agree that the environment must be protected, even at the expense of lost jobs and slower economic growth. And when it comes to making a personal sacrifice – such as having to pay higher prices to address global warming – majorities or pluralities in 14 of 25 countries are willing to do that. There is little international consensus as to which country is most trusted to do the right thing to deal with the problem of global warming. However, the publics surveyed mention the U.S. and Germany most often. Few in the survey name China as the country that can be trusted the most to address global warming. Large majorities in every country surveyed believe that global warming is a serious problem, and majorities in 15 of the 25 countries say it is “very serious.” By a wide margin, Brazilians are the most concerned about this issue – nine-in-ten in Brazil say it is a very serous problem. Roughly two-thirds or more rate it as very serious in Argentina (69%), France (68%), South Korea (68%), India (67%), Turkey (65%), Japan (65%) and Mexico (65%). 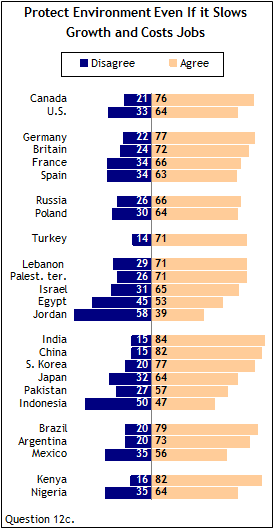 Anxiety about global warming is less pervasive among Israelis (48%), Kenyans (48%), Canadians (47%) and Indonesians (44%). Moreover, concern about global warming is low among the publics of some big polluters – including the U.S., Russia and China. Only about four-in-ten in the U.S. (44%) and Russia (44%) say that global warming is a very serious problem. The Chinese express the least concern – only 30% say it is a very serious problem, up slightly from last year (24%). Concern about changes in the global climate has increased in many countries since 2008 – including the three Middle Eastern countries of Egypt, Jordan and Lebanon. The share of Egyptians who believe that global warming is a very serious problem has increased 16 percentage points, from 38% in 2008 to 54% in 2009. In Lebanon and Jordan, where roughly four-in-ten said this issue was a very serious problem last year (43% in Lebanon, 41% in Jordan), majorities now rate it as very serious (53% in Lebanon, 54% in Jordan). And today in Nigeria a majority (57%) rate this environmental problem as very serious, compared with 45% last year. While anxieties about global warming remain mostly widespread, some publics are less worried than they were in 2008 – especially in Turkey, Poland and Japan. The decline was steep in Turkey, where the percentage rating global warming as a very serious problem dropped by 17 points, from 82% last year to a still substantial 65% this year. Today in Poland about one-third (36%) express strong concern about shifts in the global climate, compared with a small majority one year ago (51%). The Japanese have steadily become less worried about this issue since the question was first asked two years ago (78% in 2007, 73% in 2008, 65% in 2009). In the U.S., where 44% say global warming is a very serious problem, more than six-in-ten Democrats (63%) express concern over this issue, compared with fewer than one-in-five (17%) Republicans. Among independents, 43% say this is a very serious problem. However, in several countries public opinion is not as decisive. Indonesian public opinion is split – 47% agree with prioritizing the environment over economic growth and 50% disagree. A slim majority of Egyptians (53%) support protecting the environment at the cost of economic expansion, but nearly as many disagree (45%). Jordanians are the least likely to say that environmental concerns should take precedence over economic growth (39% agree, 58% disagree). This represents a 14-point decrease since 2007, when a majority in Jordan (53%) agreed. In three nations that have enjoyed strong economic growth in recent years – India, China and Brazil – agreement on this issue is nearly universal. Roughly eight-in-ten in India (84%), China (82%) and Brazil (79%) agree with prioritizing the environment over rapid economic expansion. Agreement on this issue has decreased in several countries. The change has been most dramatic in Spain, where the proportion of respondents who agree with this statement declined by 17 percentage points, from 80% in 2007 to 63% in 2009. Pay More to Address Climate Change? While solid majorities in most countries say the environment should be a priority, even at the expense of economic growth, there is less of a consensus regarding whether people should pay higher prices to deal with climate change. Majorities or pluralities in 14 of the 25 nations agree with the statement “People should be willing to pay higher prices in order to address global climate change.” In 11 nations however, majorities or pluralities disagree over combating changes in the global climate by paying higher prices. Agreement on this issue is widespread in many of the Asian nations surveyed. Nearly all in China (88%) and India (85%) and more than two-thirds in South Korea (69%) and Japan (68%) believe that people should be willing to pay higher prices to protect the environment. Only about one-third in Pakistan (36%) agree – though nearly as many are unable to offer an opinion (29%). On the other hand, a majority of Indonesians disagree with this statement (64%). In Western Europe, slim majorities in Germany (54%), Britain (53%) and France (51%) support raising prices to address climate change. Opinions are almost equally split among the Spanish (49% agree vs. 48% disagree). In the U.S., roughly four-in-ten (41%) agree that people should pay higher prices to support the environment, but more (55%) disagree. However, among Canadians more agree than disagree with this statement (54% vs. 44%). Among the publics surveyed, Jordanians and Egyptians are the most likely to disagree with tackling global climate change through increased prices (73% in Jordan, 69% in Egypt). Disagreement is also common among a solid majority in Mexico (61%), and to a lesser extent majorities in Argentina (54%), Nigeria (54%) and Russia (52%). 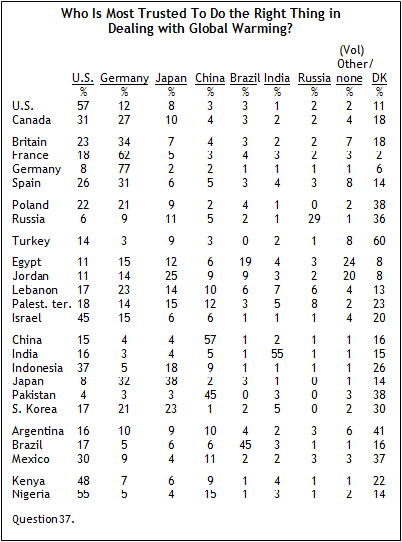 When asked which country among India, Germany, China, Brazil, Japan, the U.S. and Russia they trust the most to do the right thing in dealing with the problem of global warming, majorities or pluralities in six of 25 countries name the U.S. Americans are the most likely to do so (57%), followed by Nigerians (55%), Kenyans (48%), Israelis (45%), Indonesians (37%) and Canadians (31%). Germany stands out as the most trusted country among the publics in Western Europe. Majorities of the French (62%) and pluralities of the British (34%) and the Spanish (31%) identify Germany. And not unlike the Americans, a majority of Germans credit their own country (77%) as the most trusted to handle the issue of global warming. Germany is also favored by a small plurality in Lebanon (23%). Publics in India and Brazil believe their own country can be trusted to do the right thing in dealing with this environmental issue. A majority of Indians (55%) identify India and 45% of Brazilians name Brazil as the country that can most be trusted to address global warming. 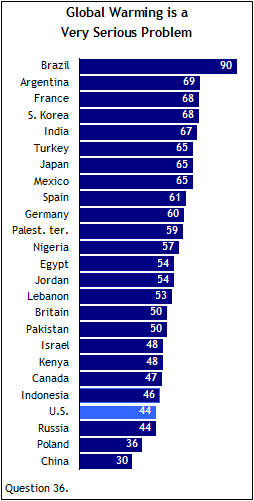 In no other countries do majorities or pluralities cite India or Brazil as the most trusted. A majority of Chinese (57%) are not alone in their belief that China is the most trusted country to deal with changes in the global climate – more than four-in-ten (45%) Pakistanis name China as well. Similarly, in addition to a plurality of the Japanese (38%), a quarter of Jordanians (25%) identify Japan as the most trusted country when it comes to combating global warming.